An employee-centric approach to rapid growth and rebranding—delivered via the intranet. When Piksel, a global leader in building successful online video businesses, set out to relaunch and rebrand after a whirlwind of acquisitions, they recognized that success starts from within. Launching a new company is a pivotal moment filled with possibilities to unite the organization, energize employees, and propel the company forward. It’s also a scary moment that can threaten morale, competitive position, and employee retention. Armed with a clear vision, innovative video technology, and an inspiring executive team, Piksel used ThoughtFarmer to amplify their message across 600 employees in 13 offices around the globe. Easy communication of news and announcements. A centralized newsfeed that can be easily managed by the communications team is crucial for communicating announcements to employees. Social tools for engagement. Engagement is about more than telling employees about the new vision. It’s about involving them, listening to their opinions, and shaping the new company together. Ability to leverage video. As Piksel’s business is to help its customers use video, it was really important for them to be able to share videos internally and to make that process more collaborative. With those goals in mind, Piksel set out to launch a new internal communications platform. The result was Popsikel—a ThoughtFarmer-powered social intranet. Popsikel embodies the Piksel brand, in a centralized location that everyone can access and contribute to. With foresight and planning, Piksel was able to launch Popsikel on the same day they re-launched as a new company. As video platform innovators, Piksel likes to say that “video is the next best thing to being there.” Piksel uses video technology in two exciting ways: executive updates and Popsikel TV video displays. ThoughtFarmer allows Piksel to embed their videos into their intranet news posts—so employees in different time zones can easily access and comment on them. Using ThoughtFarmer news feeds in tandem with their digital signage platform, intranet content is distributed in real-time on digital displays with offices around the world. 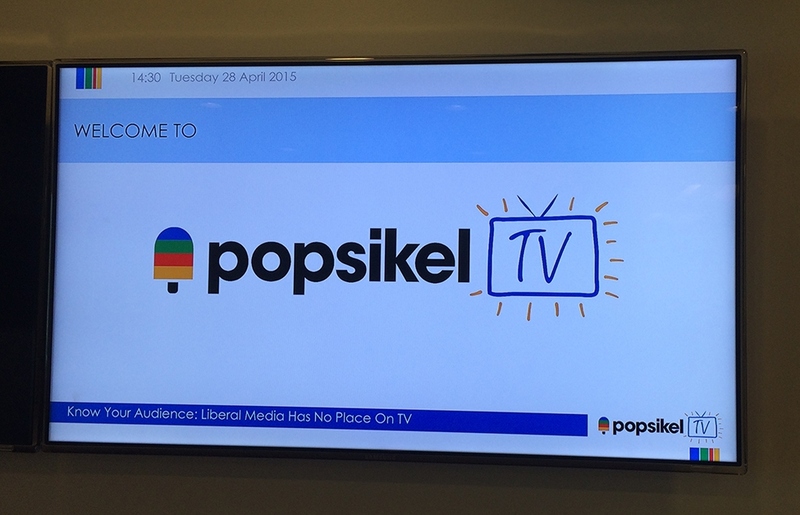 Piksel’s digital signage screen displaying Popsikel TV. Culture change can’t be a top down initiative–it’s a set of shared values and expectations that employees create together. Piksel could have tried to ‘announce’ and ‘enforce’ a new shared culture, but instead they took a collaborative approach. They appreciated that each office brought something unique to their new company. To celebrate this, they launched a video contest, where each office submitted a video celebrating their office culture. Each video was streamed live on Popsikel and the winner was announced live. This meant everyone could participate, regardless of whether they worked in an office or virtually. Shortly after, all the videos were added to Popsikel for employees watch again, and to vote for a People’s Choice winner, using ThoughtFarmer’s polling function. All 12 offices got involved, with the office in Malaga, Spain being crowned the winner. 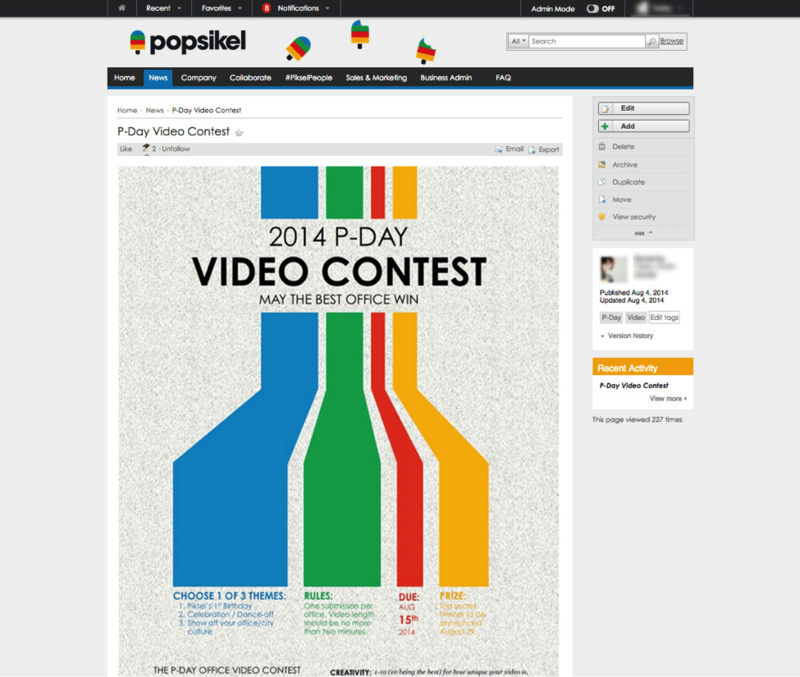 Piksel’s advertisement on Popsikel for their P-Day video contest. As a B2B technology company, engineers often significantly outnumber communications people. Their small marketing and communications team needed a way to share important updates and manage employee feedback that was fast and effective. And it needed to look good, like their new brand. ThoughtFarmer helps them to amplify their reach and reduce double work. Easy, on-brand news published allows them to reach all staff, or send specific messages to groups of employees. They also use RSS-powered newsfeeds help minimize workload by pulling in Piksel.com blog content to their intranet, to increase visibility. Popsikel has become the global information hub and everyone’s one-stop-shop for everything Piksel related. More importantly, the Piksel rebrand has built a momentum so that the company continues to grow and thrive.